"Killing and politics aren't always the same thing." 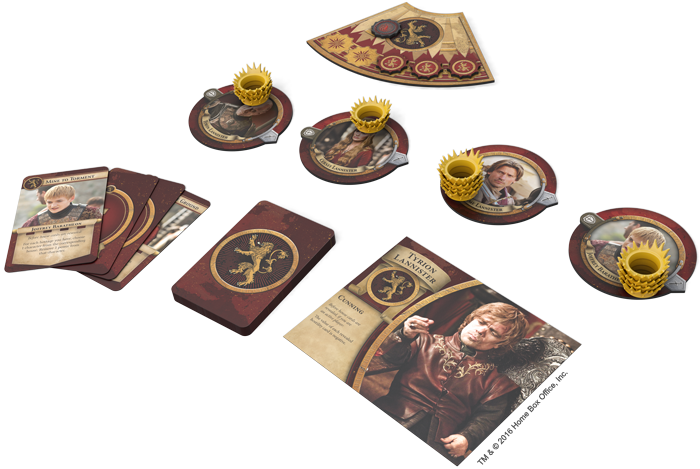 Based on HBO's hit Game of Thrones television series, The Iron Throne is a fast and frenetic board game of intrigues, battles, and betrayals for three to five players. Its character portraits, golden crowns, House insignia, hostages, character death, and character abilities anchor it firmly within the show's settings and tone, but there's also a lot of interstellar science fiction hidden deep within the game's core mechanics. 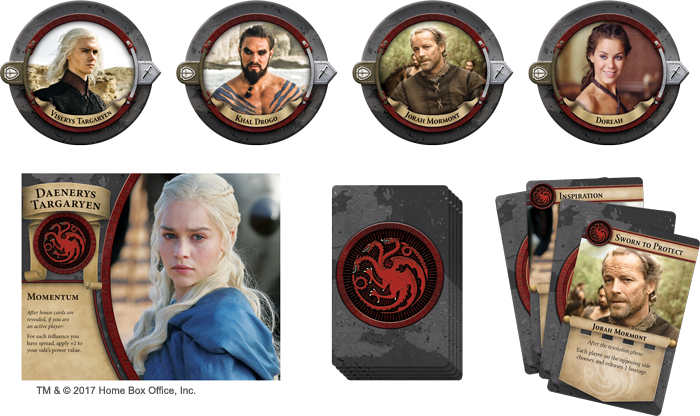 Designed by the same people who designed the legendary Cosmic Encounter® board game, The Iron Throne shares many of that game's core mechanics, even while offering a uniquely distinctive experience—one rooted in the many schemes and battles of the Seven Kingdoms. So how did the designers go about transforming a crazy, chaotic game of aliens, spaceships, and interstellar conflicts into one that makes you feel as if you and your friends are stepping into all-new episodes of Game of Thrones? Recently, we began to explore this question in our interview with the game's designers—Bill Eberle, Peter Olotka, Greg Olotka, and Justin Kemppainen. We learned how their passion for the show guided their development of the "hostage" rules and the game's darker and "meaner" tone. Today, as we conclude our interview, we start with another question about the game's tone and the challenges the designers faced as they moved away from the light-hearted hilarity of Cosmic Encounter. FFG: Peter, although you guys went on to address some of the ways that players find humor in The Iron Throne, you mentioned you were initially worried that it might have been too grim a departure from Cosmic Encounter. Do you think—in theory—The Iron Throne could have been a successful game if players had fun, but weren’t laughing? PO: Probably, but I like humor to be woven into the fabric of the design. GO: Yes, I think the game could still be successful in that situation. There are far more Game of Thrones fans than Cosmic Encounter fans. And there are plenty of “real gamers” who ding Cosmic Encounter for being too chaotic and silly. The Iron Throne may be just what they have been looking for all along. I've seen a few comments already out there that allude to that. JK: I think this game needed the aspects of dark humor found in the series. The series itself is frequently funny—mostly when Tyrion is in the scene. It’s not all doom and gloom all the time. 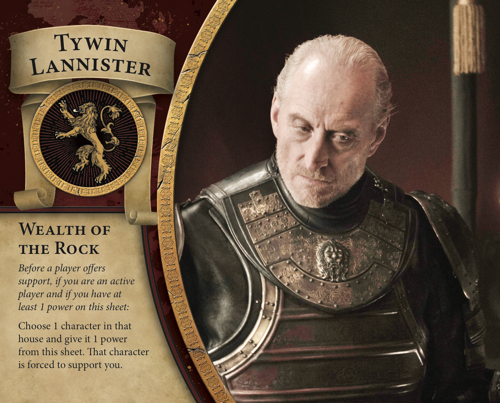 GO: That's true, and of course Tyrion’s one of my favorite characters. He is the master manipulator, and it is refreshing to have characters get by on their wit, wisdom, and negotiation skills rather than being 7’4", 350 lbs., and handy with a broad axe. FFG: At this point, I think we all agree that The Iron Throne is like a darker and “meaner” version of Cosmic Encounter, but still not without its dark humor. How important do you feel the mechanics for taking hostages and character death have been in translating the tone of the game to fit the show? What can you say about the development of those mechanics? JK: Hostage taking and character death were absolutely crucial to implement. So much of the series is built on this idea that no one in Westeros is safe. It creates an important tension while you’re watching the show. BE: I think a major difference between Cosmic and The Iron Throne is that in The Iron Throne components can die. The closest to that in Cosmic is the Void. So we had death, but not as a constant for all games. JK: The development of the hostage and death mechanics went a few directions that were too fiddly or less elegant. But they slowly connected to the idea that the character’s cards in the deck were linked to the characters themselves, and subsequently, this led to how hostages were taken. PO: I also like the independent hands of cards. It solves a lot of fussy stuff and makes the hand a known quantity. Some of the BoardGameGeek comments are put out by it, but The Iron Throne is the better for that approach. JK: I also recall a lot of back and forth on exactly what percentage of the deck would be linked to specific characters. GO: The tricky part of hostages was how to handle the different kinds of cards. Hostages don't just allow you to blackmail your opponents; they can also empower some of your own strategies. FFG: Of course, hostages are only part of the game. There are so many ways that it goes about evoking Game of Thrones, so how did you go about making sure that The Iron Throne was Game of Thrones to its core? 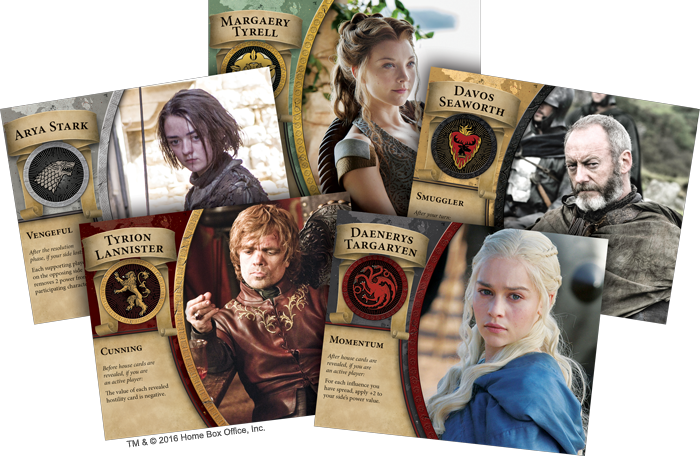 BE: I started by gathering information and immersing myself in the world of Game of Thrones. Then I added family and character tables to our Cosmic Encounter alien and alien flare database so we could try out some match-ups. I think we started on a Thursday or Friday, and by Monday we had a fairly detailed spreadsheet map of the possibilities. JK: I remember the spreadsheet. We initially mapped the characters to existing aliens in order to get some solid proofs of concept going. BE: Over time, the alien match was much less important. We would say that a character has some of an existing alien in it, but started to focus more on the specific language for the leader or the character card. GO: I was really into it. 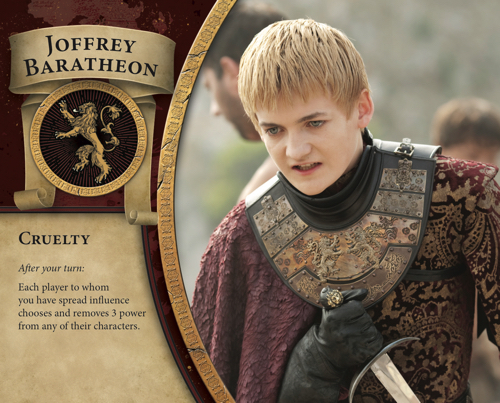 To get up to speed quickly, I'd watch on my computer with the Game of Thrones wiki open on another screen so I could read along and get more background behind the characters' motivations. PO: It became quickly apparent that—in general—you could not count on the name of an alien to be a guideline for good match for a Game of Thrones character who seemed to have similar traits. 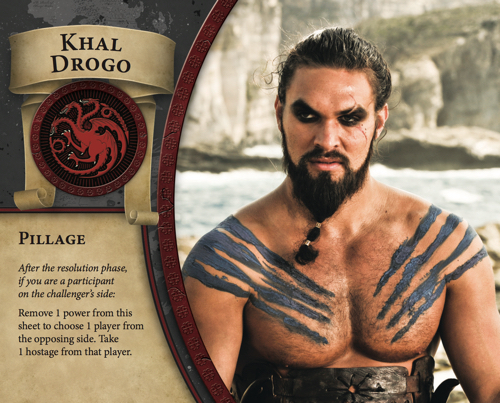 So Warrior could not become Khal Drogo, for example. BE: I created sheets of quotes for many of the characters—to better understand and remember the kind of person each character was. FFG: Peter, why did you see those one-for-one translations break down? Was it about matching the personalities or something else? PO: The manifestation of the power didn't fit. FFG: You guys have mentioned the BGG community a couple of times. FFG: So if some members of the gaming community are still uncertain what they should make of The Iron Throne in a world where they can already pick up Cosmic Encounter, how would you describe the two games’ different moods? When should I play The Iron Throne, and when should I play Cosmic Encounter? 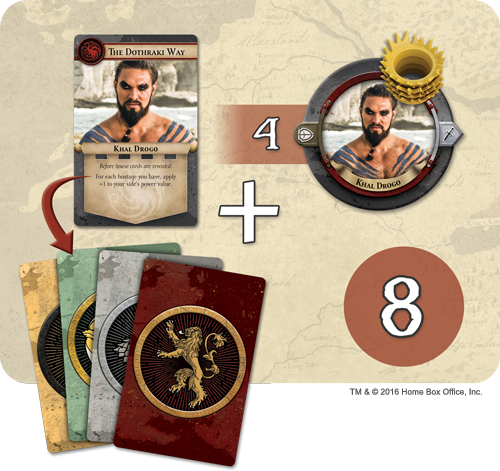 BE: The Iron Throne is more accessible than Cosmic, easier to teach a new player. It should also should work in most cases when you have a group where everyone is an HBO Game of Thrones fan. GO: I would say this: Play The Iron Throne first, with people who are fans of the show. Then slowly introduce them to Cosmic Encounter… Start planting seeds. JK: Our The Iron Throne games tended to be shorter than Cosmic. GO: One thing I've noticed about the comments is people are saying five is the optimal number of players… for both games. FFG: Why do you find that player count notable? GO: I've seen several comments from people saying they said it played best with five. The balance of power was optimal, it worked better for alliances, and so forth. JK: That fifth player can add a lot of intrigue and discussion, as they tend to be the person to tip the balance of a pretty even encounter. It’s also important to note that, via the game mechanics, in many cases they would’ve been the challenger from the previous turn. A lot of potential for grudges to be held if things didn’t go properly. BE: Players who love science fiction and the idea of alien cultures can have a lot of fun with Cosmic because it spoofs and plays with that world. Players who haven't been part of the science fiction world will prefer The Iron Throne. FFG: Final question. Do you have any favorite moments or Houses? 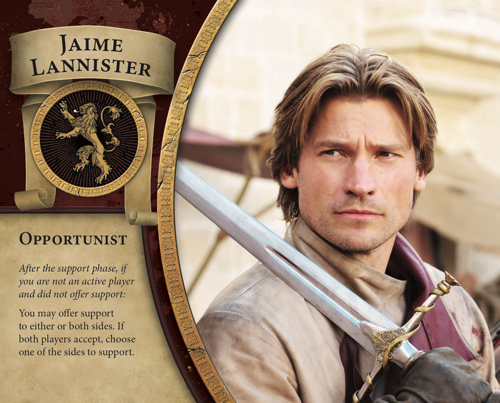 GO: I'm a little ashamed to admit it, but I'll take the Lannisters. BE: The houses have important strategic differences. But my emotional choice is the Targaryens. 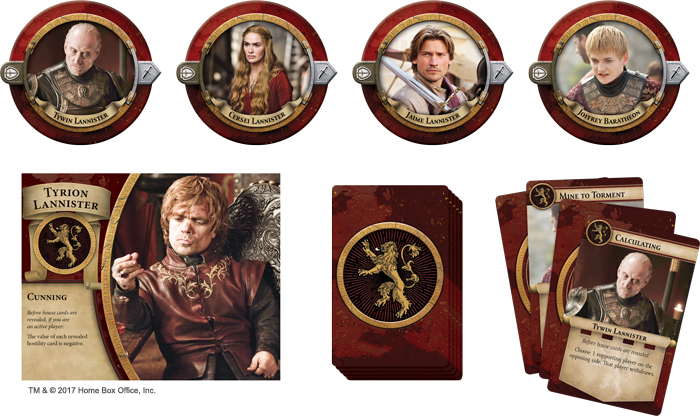 FFG: Greg, why the Lannisters? GO: It's just fun being so evil… Also, I think the mix of Lannister Leader abilities makes it an interesting house to focus on. I feel like if I played Jamie, Tyrion, Tywin, Cersei, and Joffrey back-to-back-to-back I'd come away with a deeper understanding of how to master the game. 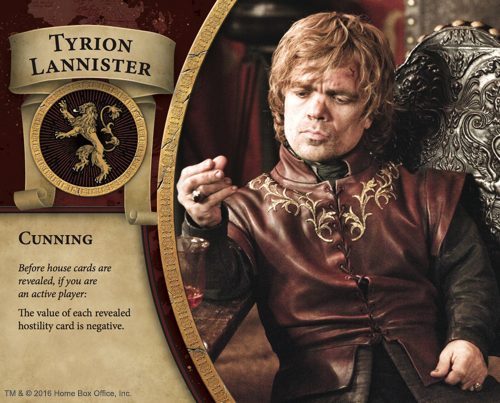 Plus, Tyrion and Jamie are refreshingly less evil than the others. PO: I think the evil thing is important. It flows from the series. If the game was just out there as some generic fantasy title—or whatever—players would not have such immediate reactions. PO: My favorite The Iron Throne moment was the beginning of a game where players (who, except one, were all fans of the series) immediately made commentary about who they were out to get—sometime with details and specificity. It was as if they were in some episode and were going to avenge an injustice. BE: I agree, Peter. I like the experience of creating a new Game of Thrones episode where things turn out differently than in the series. 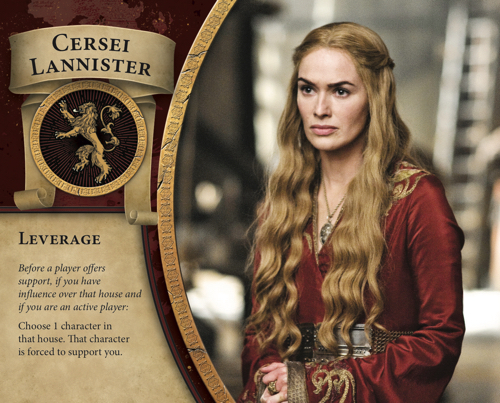 To seize the Iron Throne and rule the Seven Kingdoms, you will need strength, cunning, and charisma. You will need to master your battles, hatch far-sighted schemes, and manipulate the support of the other Houses. Most importantly, you will need a copy of The Iron Throne! 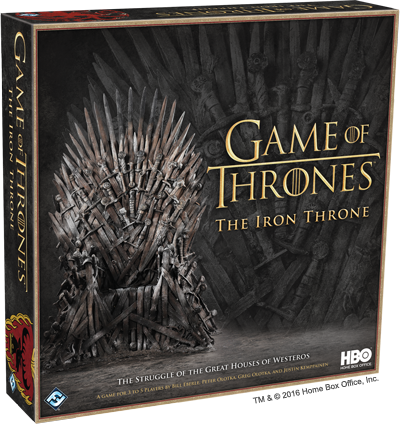 Take your first steps into the intrigues and battles of Westeros with The Iron Throne. The game is currently available at retailers everywhere and online via our webstore.